Thomas Hobson will target the Melbourne Cup after winning the Ascot Handicap for trainer Willie Mullins and jockey Ryan Moore. It is the third time the pair have teamed up to take the two miles, four furlongs contest. The seven-year-old Halling gelding was the 4/1 favourite and beat Endless Acres, trained by Charlie Fellowes, by six lengths. "Melbourne is the endgame," said Mullins, Ireland's champion jumps trainer. "We got around with firm ground today. Maybe he's more mature, maybe he will take running on firm ground, but it opens up more opportunities for us, including Melbourne. I spoke to John Gosden last night [who trained Thomas Hobson in the early part of his career] and he said he didn't enjoy ground like this as a young horse, but maybe he's more mature. "'We have only got one runner this week, although I had five or six entered. I was just a bit worried about the ground. "We will see how Thomas Hobson comes out of it before deciding if he runs again on Saturday [in the Queen Alexandra Stakes]. The only thing is that this was a record time and the ground is only going to get faster all week. "The Melbourne Cup would be the first thing on my mind. To me, that performance is good enough to go there, but there is probably another race or two to go before then. "It's fantastic to have a winner at a festival like this - it's magic." Ryan Moore, who was riding his first winner at this year's Royal Meeting, said: " I felt it was a strong pace and let Thomas Hobson warm in to it. At Swinley Bottom they were slowing down every step of the way and it was about giving him a clear run at that stage. He has won very easily. "Turning in I was thinking, 'just get a clear run and he'll win from here'. Like all Willie's horses, he stays very well and is very fit." " It is a remarkable experience. Thomas Hobson looked very fit to me and I thought he would do himself justice," said winning owner Rich Ricci, who owns many of Mullins' best jumps horses. "I was not sure about the ground, but he was very, very good today. This isn't our game but it's great to be part of it." Young trainer Charlie Fellowes is looking forward to the future with Endless Acres, who finished a fine second. The four-year-old son of Champs Elysees was always well positioned under Stevie Donohoe but could not match the winner's finishing kick in the closing stages, who spread-eagled the field to score by six lengths. Alan King's Who Dares Wins, who led the field into the home straight kept on tenaciously to finish one and three-quarter lengths behind in third, with a further two and a half-lengths back to his stable companion Rainbow Dreamer in fourth. Fellowes said: "We were beaten by the better horse on the day but he has run his race. That was a superb effort and he has absolutely run his heart out. "He is a real superstar for us. He is a nice stayer taking on older horses today and that makes him a young horse to look forward to. "He has had a very hard race today, it was a warm day and we will give him a good break after this. "We will probably look to campaign him over two miles or two and a half miles and something like the Cesarewitch could be a possible route to go down but I am really proud of him. Stevie Donohoe, rider of the second Endless Acres, said: "I thought we ran a really strong race. My horse stays well and the winner is obviously OK. We just rode a good staying race." 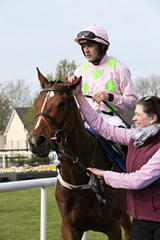 Alan King, trainer of third and fourth Who Dares Wins and Rainbow Dreamer, said: "They have both run very well. They have run their races and I am thrilled with them. "To come here and be competitive is a real thrill. "We will have to see what we do next. Rainbow Dreamer probably wants to come back in trip and I don't know what we will do with Who Dares Wins."